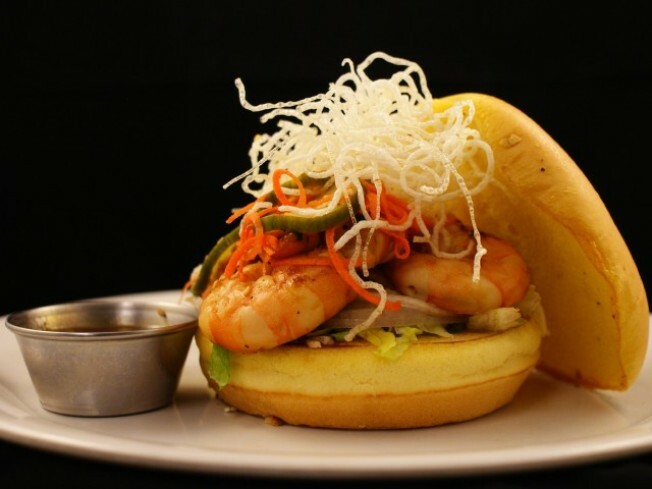 The Kung Pao Shrimp Burger: Stuffed with grilled shrimp, and other yummy, pickly, fried tidbits, between two buns. We're not going to get into the whole beef burger vs. every-other-kind-of-burger fracas. Because really, all burger fans everywhere should hold hands and sing. Hands sticky with ketchup, and relish, and spicy Kung Pao sauce. Who's making it? The Counter restaurants. It's the Burger of the Month for The Counter, so look for it during September. What's in it? As we mentioned, the grilled shrimp. It's been marinated, too. Plus pickled cucumber salad, fried rice noodles, red onions, and sauce. Lots of saucy sauce. You can also savor it bun-less, in a bowl. Price: $13 at the Santa Monica branch of The Counter. Sides: They're extra, but we always crave the crunchy with our burgers. That's universal, right? Counter recommends the Sampler starter, which comes with a whole mess o' dipping sauces. Included are French fries, sweet potato fries, onion strings and those fried dill pickle chips. As long as those are included. We've made those our entire meal before. No guilt, and we didn't do *too* much looking at other patrons to see if they were watching us. Just the occasional glance.